Up to date posting as of March 28, 2019. NOW RESERVING NEW YEARS WEEK 2019-20. NO OTHER WEEKS AVAILABLE. SEEMS EVERYBODY SAYS 'we're ski-in, we're ski-out'....GIMME A BREAK! THIS IS TRUE SKI-IN, SKI-OUT....in fact...if you don't SLOW DOWN at the bottom of the mountain....you'll run RIGHT THROUGH the Sheraton's Lobby! NOTE: THE SHERATON STEAMBOAT MOUNTAIN VILLAS ARE TIMESHARES OWNED FOR SPECIFIC WEEKS. WE OWN NEW YEARS WEEK ONLY. NO OTHER WEEKS AVAILABLE. 100% MOUNTAINFRONT - THREE VIILLAS AVAILABLE! ONLY FOR New Years Week 2019-20. These dates are SPECIFIC and can't be changed! 2BR, 2BA: Unit 7802 or 7702 (Top Floor 8th and 7th)) Facing Slopes, front & center! BRAND NEW SHERATON 'MORNINGSIDE' RESORT VILLA...This Villa Is Top Floor, direct mountain front, slope side, ski-in/ski-out.... right at the base of the mountain next to the lifts! FANTASTIC 100% LOCATION & VIEWS! When you rent through us, you pay NO added Resort fees! (All rentals through Front Desk pay an added @11.7% Colorado tax, plus $20 per day Resort Fee if booking through the Front Desk or 800# Reservation System). 2BR (Sleeps up to 07 w/1 roll-away*). 1,617 sq.ft. **Children participating in the Kids Ski Free lift ticket program will also receive FREE Ski Rentals at all Steamboat Ski & Sport locations and Ride Sports when parents rent skis for five days or more. Built in 2008, this Sheraton Steamboat Villa has the best 100% location in all of Steamboat. This Villa is the best of the best....TOP FLOOR, DIRECT MOUNTAIN FRONT UNIT. Complete with fireplace, full granite-countered kitchen and baths, and gorgeous views. BEST OF ALL....this ski-in, ski-out Villa is 100% direct mountain front, with incredible views of the lifts, the mountain and trails, the gondola building, the works. The ski shop for rentals and/or storage of your ski equipment is directly below the unit, just down the elevator. Get off the elevator, pick up your skis, ski about 100 feet....and get on ANY of the Mountain Base LIFTS (Gondola, Christie II, Christie III, Preview, etc)! The building also has private rooftop slope side hot-tubs. It has 7 floors, 3 units per floor, each floor served by private elevators. Steamboat has so much to do (we did it all)...dog sledding, great quaint western town shopping, snowmobiling, open sleigh rides, fabulous restaurants, ice skating, tubing, ranches.....I promise you and your family a fantastic Christmas-New Years ski vacation. The Sheraton Steamboat has THE ABSOLUTE BEST LOCATION OF ALL AT STEAMBOAT for skiing....it's RIGHT ON THE MOUNTAIN BASE, NEXT TO THE LIFTS! - Rooftop terrace with outdoor whirlpool spas - spectacular mountain views and really private! - Most convenient location in Steamboat! Let's get started on a ski vacation rental you will remember for years. OWNER'S NOTE: OUR VILLA PRICES ALWAYS BEAT ANY OTHER PRICE! EITHER THE SHERATON'S FRONT DESK PRICES OR OTHER OWNERS FOR THESE VILLAS....IF YOU SEE THEM FOR LESS.....JUST TELL US! ONCE WE VERIFY THE PRICE....WE'LL BEAT IT! 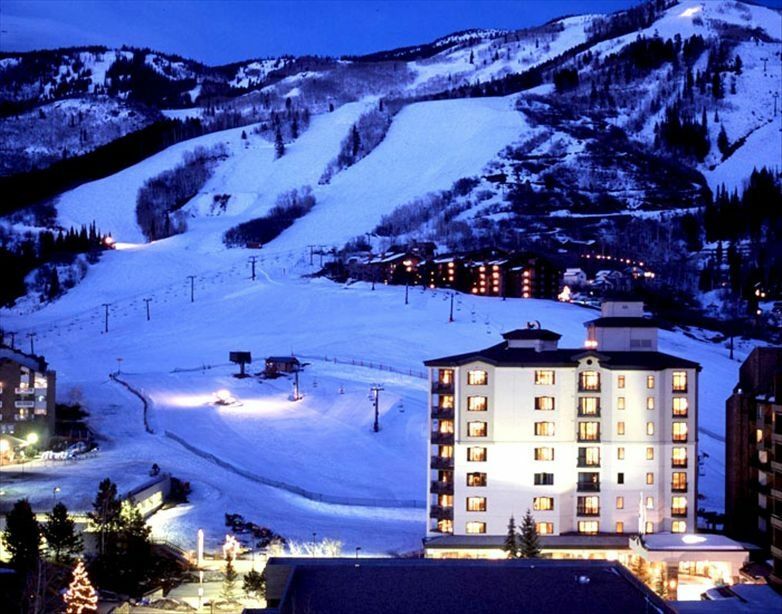 Keywords: Vacation Villa - Top Floor ski in ski out Sheraton Steamboat located at mountain base. Hi....I am a Real Estate Broker from Ocean City, New Jersey. Our family went to Steamboat in 2008 for the 1st time and LOVED it! We bought 3 units there for New Years Week. The Sheraton is absolutely perfect for family vacations....located at the very base of the mountain, directly next to the lifts....the best location! As a family, we travel 3-5 times per year and also own Starwood Timeshare Properties in Hawaii, The Bahamas, And St. John. We love this Sheraton Steamboat property! You will, too! Direct Mountain Front. Unit Is 100% directly in front of the Lifts. I forgot my sunglasses, and my wife dropped them off the balcony to me while I was getting on the lifts! Absolutely the best location on the mountain for ski-in, ski-out. The Sheraton Morningside Villas was absolutely the nicest place we ever stayed at.Very spacious,beautifull,clean comfortable rooms, with consideration to every detail.Great washer/dryer, Easy access to ski in/ski out. Most gracious front desk,incredible customer service.I have to say,we were very impressed by Sheraton. ALSO: NO REFUNDS! Trip Cancellation/Travel Insurance is widely available.